2. Arkell, Lord of Dent (listed in the Doomsday book of Edward the Confessor). 7. Adam, Lord of Dent, 1252, A.D.
8. Adam de Madekalf in Yorkshire; killed 1278 by Steynebrigge in single combat (during reign of Edward I). 14. James Metcalf of Nappa in Wensleydale (1389-1472), married daughter of Gelsone (Gibson?) of Ireby Hall; was captain in the battle of Agincourt in 1415, in which Henry V's archers decisively defeated the French mounted knights. Sons: Reginald, Brian, Myles, Thomas. 15. Bryan Metcalfe of Beare Park (maybe born abt 1420-30); married Joanna of Boughton. Beare Park, Marrich, Wensleydale, was long a residence of the Metcalfs till it was confiscated in 1543, under Henry V's suppression of Monasteries. His sons were: Richard (b1450), Leonard (b 1460), Nicholas and Roger. Leonard married a Thursby and left children: Leonard, Vincent, Godfrey, Ambrose. 16. Leonard? Metcalf, b abt 1460. There might be another generation here also, b abt 1490. 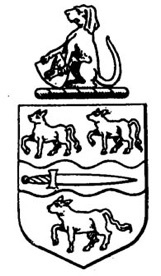 According to the Harleian Manuscript their coat-of-arms were granted in 1483; the crest in 1487. 17. Leonard Metcalf of Yorkshire, (maybe born about 1520) a zealous Catholic and supporter of Mary, Queen of Scots joined an uprising in 1569 and was condemned to hand with 10 others for treason and rebellion against Queen Elizabeth. He was on a list of prisoners taken to Durham Castle in Jan, 1570. but he managed to escape execution. He had arranged for his lands and estate to be given to his wife at his death, so the Queen realized she could take his lands for treason while he was alive, but would lose them if she killed him, however she still wanted to make an example of him and the others. The Commissioners decided against it and only 4 of the 11 were executed--Metcalf went free. After he lost his property, his family moved to Tatterford in Norwich and became Protestants. (from Metcalf Genealogy.) It's not certain whether he and the Leonard below were the same man, but probably were father and son. 18. Rev. Leonard Metcalf of Tatterford in Norwich (1541-1616). In 1580 Leonard was Rector of the Parish of Tatterford. His son Leonard was baptized there in 1585, and son Michael, June 17, 1587. 23. Samuel Metcalf Sr. (1739 Mass—1817 NH), married Lois Kingsbury; Lt in Rev War. 24. Obed Metcalf (1763 Mass—1836 NH), married Abigail Park; Obed was a captain in the Revolutionary War. 25. Moses Metcalf (1793 NH—aft 1880 MN), married Nancy Williams; died in Minnesota. 26. Susan Mariah Metcalf (1823 NH—1896 Mo), married Miles Pease; moved to Minnesota1855, then to Missouri 1859.